I had a briefing with the panelists for the SME Insights Panel at the Alternative & Receivables Finance Forum today, ahead of the event that I have been asked to moderate next week. The forum is organised by BCR Publishing, and there is a full day of presentations, panels, case studies and networking opportunities planned around alternative and receivables finance. The SME Insights panel promises to be a great discussion, with some heavy weight panelists presenting and discussing actual research about SME customer insights, and practical ways that finance companies can improve their product offerings around what customers need. Don Brown - Finance Lawyer at Ashurst the global law firm. Tony Baron - Treasury Policy Chair at the FSB. Shiona Davies - Director at BVA BDRC, who publish a regular SME Monitor, tracking the attitudes of UK businesses. There will be findings from the SME Monitor presented at the forum, which will be worth understanding for anyone involved with product development around the receivables financing sector. It is going to be interesting to hear more from the panelists, so I look forward to the event. 8 out of 10 SMEs are profitable. 47% of SMEs plan to grow this year. 38% said they thought it could be hard for a business like theirs to get finance. Fewer than 1% of SMEs reported using peer-to-peer, crowdfunding or single invoice finance. 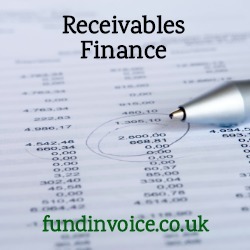 This once again highlights the need to increase awareness of forms of alternative finance, such as receivables finance, a need that I have mentioned many times before.